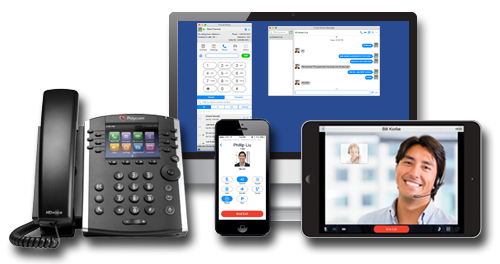 Communicate more profitably using the features of a Fortune 500 phone system like direct inward dialing, extension dialing, auto attendant, ring groups, call recording and Internet faxing. Use your cell phone as an extension of the office phone system. Reach employees no matter where they are working. Setup remote staff with a desk phone in their home or satellite office. One vendor, One application to manage. For companies of ten to thousands, and for one to a thousand offices. Communicate easily between offices and staff no matter where there are located. Empower everyone to work together more effectively no matter where they are with collaboration capabilities like web conferencing ​and video meetings. Eliminate your costly phone circuits and utilize your Internet circuit for your voice traffic.